LONG BEACH — For years, boaters traveling to the south side of Long Beach Harbor have cruised to the west side of Pine Avenue for temporary mooring. The east side was, for as long as current city management can remember, without a guest dock. However, for the last year and a half, a 1960s-era 320-foot wooden dock filled that gap, as it floated — unofficially jury-rigged, city officials said — adjacent to the Pine Avenue Pier. The dock was paid for privately, had an array of “no trespassing” and “no parking” signs, and allegedly the only “guest” there was a sailboat that took first-to-finish honors in this year’s Transpac Race. John Sangmeister, owner of the sailboat and the nearby Gladstone’s Restaurant, and an avid crusader for guest docking in Rainbow Harbor, reportedly salvaged the dock — which would have otherwise been disposed of — from Long Beach Yacht Club during a renovation project almost two years ago. 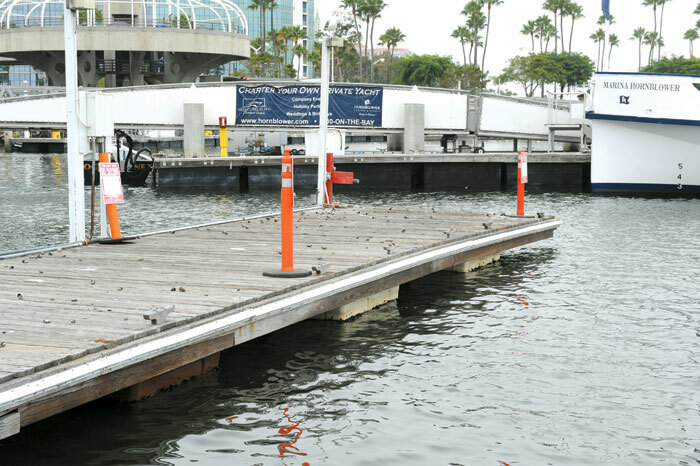 On Sept. 10, the dock was removed by the city after being declared “unsafe” and “inaccessible to the public,” only a few days following the abrupt announced retirement of the man who had reportedly permitted its placement: Mark Sandoval, manager of Long Beach Marine Bureau. While he declined any initial statements to the press following his retirement, Sandoval spoke at the Sept. 17 Long Beach City Council Meeting and claimed he was unfairly forced out of his position. Long Beach’s director of Parks, Recreation and Marine George Chapjian reportedly served Sandoval with a letter outlining plans for his termination. Reasons cited were Sandoval’s hand in the voiding of 98 citations written for vessels whose harbor permits were in question, and a moment of alleged unprofessional conduct during a discussion between Sandoval and Chapjian, which revolved around the issue of the dock. Sandoval said he did raise his voice to Chapjian in response to the accusation, but claimed that it was the only time. “My director then asked me about the boat docked at the dock,” Sandoval said. “I told him when John (Sangmeister) brought the dock over, he brought his boat there. “He asked if I approved it,” Sandoval said. “I told him I did not approve it — but I did not tell him to move it, because I saw no problem with it. Not only did he still own the dock, he spent thousands of dollars moving and engineering (it). “In addition, the city could not use the dock for guests until it was engineered and retrofitted, and the boat itself is creating no issue in the harbor,” Sandoval said. According to Sandoval, the dock went through two engineering studies — first by Transom, which said that it couldn’t be properly installed without pile driving. “The Coastal Permit wouldn’t allow it,” Sandoval said. The second study, by Blue Water (which Sangmeister reportedly paid for out of pocket), suggested the use of a Seaflex mooring system to install the dock. “They’re basically like large rubber bands. You can use them to secure docks. Blue Water wanted to use Seaflex to wrap around the piles of the pier,” he explained. While sources state that the wooden dock was discovered Aug. 19 during inspections for the Red Bull Flugtag event in Long Beach, Sandoval said that Chapjian and other city officials were already well aware of the temporary dock. Sandoval said he drafted two memos about the dock to assistant city manager Suzanne M. Frick in early 2012 and in April 2013. “The only communication between Mark and I is this memo,” Frick said. “I responded with a letter mentioning that (the dock) is not on the tidelands list, and they needed to talk about the funding,” Frick added. Sandoval said that two movies were filmed using the dock, and he added Transpac Race boats were docked to it this summer. Responding to that claim, Frick’s office searched through files at the Special Events and Filming Department. No documents permitting such filming could be found, Frick said. There were only two film permits in September and November of that year that specified uses of locations around Pine Avenue and Rainbow Harbor. Frick also said that city management knew nothing about the Transpac event’s use of the dock, meaning that it was done “off record.” Had the Transpac Race event management applied to use the dock, they would have been turned away, she said, as the dock lacked coastal permits and was declaredly “inconsistent” with building and safety standards. However, with the approval of the Marine Bureau, the temporary dock placement was permitted. “There is a very specific coastal permit that only allows a public dock with a maximum of three-hour parking,” Frick said. Apart from requiring public access, the permitted dock would also have to be L-shaped or U-shaped to fit unobtrusively to Pine Avenue Pier, said Tom Modica, director of Government Affairs and Strategic Initiatives. Sangmeister’s Z-shaped dock carried “no parking” and “no trespassing” signs, he said. City officials said that after the dock was discovered by city management, an extensive review of the dock transpired. While Sangmeister, at press time, had not returned calls from The Log seeking his comments on the matter, Sandoval said that the restaurant owner claims to have invested more than $16,000 in the dock, which Sangmeister claims was purposed for the city’s use.